When it seems that bacon is being used in every dish possible nowadays and with entertaining season just around the corner, this is the perfect recipe to provide to you. 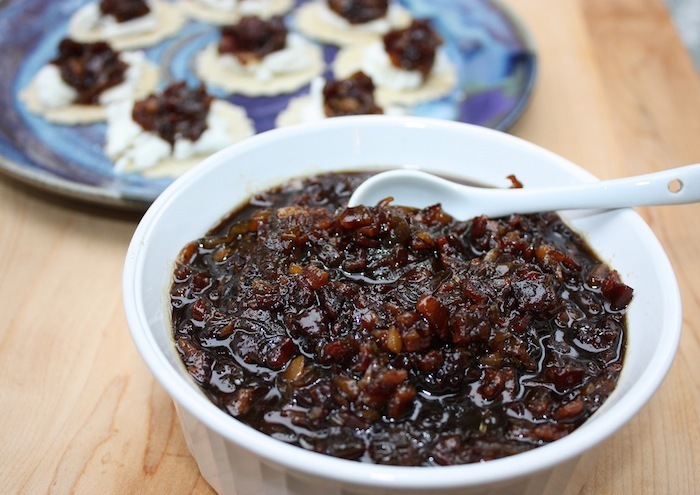 Made with Lepp’s delicious double smoked bacon, this incredible bacon jam recipe is the perfect topping for almost any appetizers you may be thinking of offering to your guests, like bruscetta, cheese & crackers, canapés, etc. My favorite is paired with soft unripened goat cheese (chevre) as the creamy tanginess is the perfect match for this sweet complex concoction. An even better idea would be to make a number of batches, and give them away as gifts in little fancy jars. I am also a huge fan of rosemary and have found that using just a tablespoon of chopped fresh rosemary gives it the herbal infusion I am looking for without it overpowering the other flavours. Enjoy! Add the bacon pieces to a large heavy bottomed pan or dutch oven. Turn the heat to medium/high and cook the bacon until almost crisp (browned and cooked, but not crisp). Reduce the heat to medium as it starts to turn brown, stirring occasionally for approximately 20 minutes. Remove the cooked bacon with a slotted spoon and set aside on paper towels to drain. Remove all but 1 tablespoon of the bacon fat from the pan. Turn the heat to medium and stir in the onions to the tablespoon of bacon fat followed by the garlic. Cook, stirring occasionally, until this onion/garlic mixture is softened and slightly browned, approximately 5 to 7 minutes. Add the coffee, brown sugar, maple syrup, vinegar, rosemary, and reserved bacon. Stir to combine and increase the heat to medium/high to bring to a boil. Once boiling, reduce the heat to medium/low and simmer uncovered for approximately 90 minutes until the mixture is syrupy and has a jam like texture. Transfer this mixture to a food processor and pulse a few times until the consistency/texture is what you desire. Will last up to 3 weeks in your refrigerator.